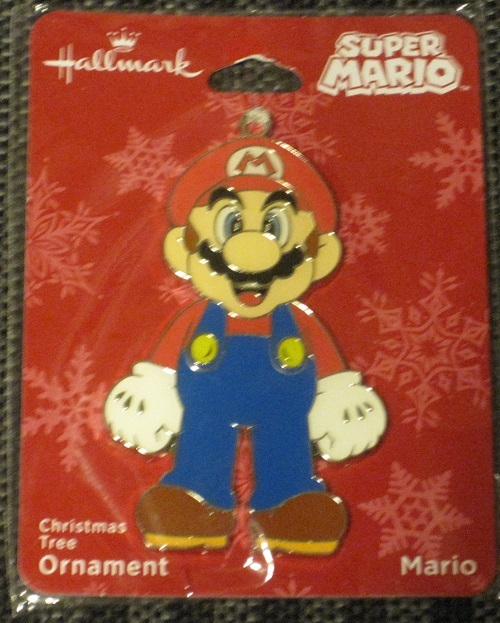 Christmas is almost here, and what better way to celebrate than with some Nintendo themed Christmas ornaments you can get at Hallmark! I managed to get them all, and there’s a nice variety of them, so let’s check them out! The first one is of a Donkey Kong arcade cabinet. 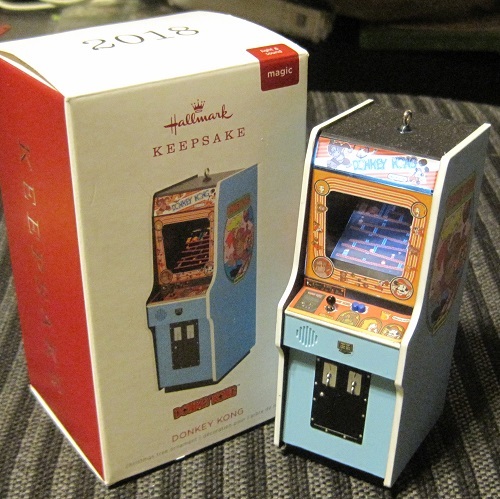 A few years ago, Hallmark did some arcade cabinet ornaments of Pac-Man and Galaga, so I’m glad they’re continuing to do that here. The ornament has all the authentic artwork, even on the sides. When you press a button on the ornament, it lights up and plays sounds. The marquee lights up and the screen shows a scene from the DK arcade game. Unfortunately, the lights on mine didn’t line up very well. I know those things can happen when you mass produce something, but I still with it could’ve been better. But my brother Jeff made a good point. He said the imperfections make it look like an old arcade cabinet that has been through some wear and tear, so that’s kind of a neat way to think about it. The sounds it makes are from the arcade game. It’ll play the diddy when DK climbs the ladder with Pauline, then Mario’s walking and jumping sounds as well as the bass music in the background. Then it plays the theme when you pick up the hammer, followed by more sounds and the music that plays when Mario gets hit. Here’s a picture of the ornament. The next ornament doesn’t light up or make sounds, but it’s still very nice. It’s of Mario Kart! The wheels do roll, which is pretty cool. I only wish that Mario held the checkered flag at a higher angle, as I believe that would make it show up better. But maybe it would also make it easier to break or snap off? I don’t know. 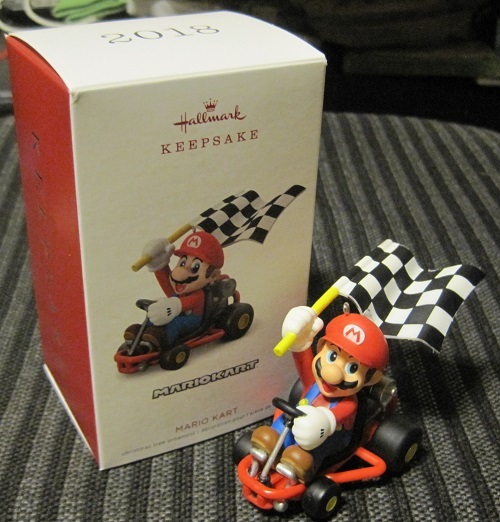 Just goes to show you how popular Mario Kart is if they’re making an ornament out of it! Too bad they didn’t have other characters. I would’ve loved to have had a Toad Mario Kart ornament! Next up is one of my favorites. It’s a Legend of Zelda ornament. I’m glad they went with the classic Link design on it. Don’t get me wrong, I do like the more modern Zeldas like Breath of the Wild and Ocarina of Time. But the classic Zeldas are really my jam! When you press a button on it, it’ll play the first 45 seconds or so of the title screen theme from the first NES Zelda! Yes! I think this ornament would also make a great amiibo, don’t you? While I’m here talking about ornaments, I got a couple of extras I thought I’d show you here, too. The first is just of Mario standing there. It’s just a flat ornament that could probably be a keychain as well. And even though it says Hallmark on it, I actually got this one at Wal-Mart. I only wish they would do other characters besides Mario all the time. Wouldn’t a Kirby or Animal Crossing ornament be cool, too? The last ornament has nothing to do with video games at all. 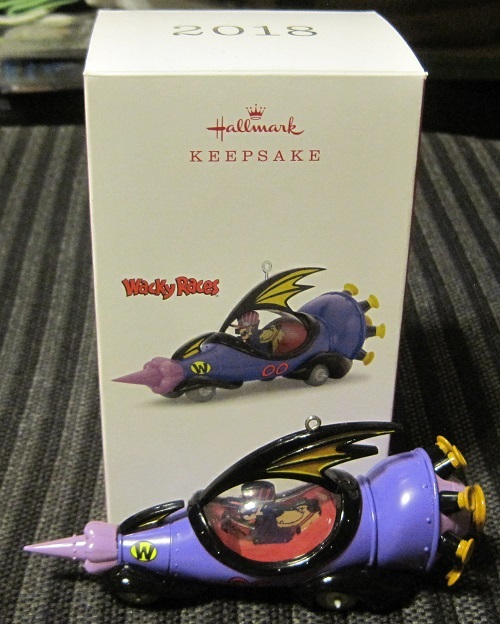 But when I was ordering these at Hallmark.com, I saw one of Wacky Races, which is one of my all-time favorite Hanna-Barbera cartoons (I met Don Messick, the voice of Muttley once). Unfortunately I was rather disappointed with this ornament. It feels really lightweight and cheap, the characters in the cockpit are just flat cutouts, and the wheels don’t even roll. Not worth what I paid for it, that’s for sure. And those are the ornaments. Let me know what you think in the comments section. What video game ornaments would you like to see them make next? LOVED wacky racers… didn’t they also have some sort of battle of the network stars equivalent? Whoa! That DK cabinet is very detailed. I may have to go looking for one. And a Wacky Racer? Just that it exists is something. I want one.